The Story of “B” There once were three little girls, living in the heart of Williamson County. All under the age of 10, their biological family didn’t have the means to provide the home they needed. Soon, dire circumstances mandated that the children be removed from their home and thus their journey through the system began. For half a decade, the girls were in and out of the Williamson County Juvenile Court. Two of the girls had never known anything else. During this time they had six different Department of Children Services caseworkers, three DCS Attorneys, and three different foster families. The individuals that remained a constant in the girls’ lives were Juvenile Court Judge Sharon Guffee, their Guardian ad litem and their Williamson County CASA (WCCASA) advocate, the non-profit that trains volunteers to represent the best interests of abused and neglected children in the courtroom. 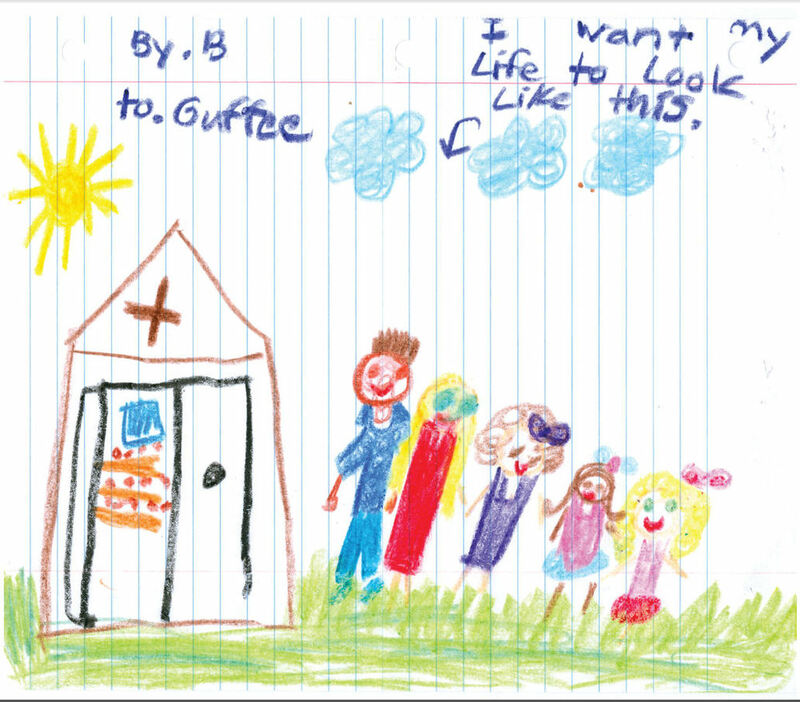 One day the WCCASA volunteer assigned to the girls’ case asked “B.”, the oldest of them all, to draw her dream family for Judge Guffee. B. drew a mom, a dad and her three siblings holding hands next to a tiny little home. Today, after four-and-a-half years in the Juvenile Court system, B.‘s life looks a lot like that sketch she drew. For this little girl, it’s a dream come true: she has a safe home with a mom and a dad, and all of her siblings were adopted together. That sketch currently hangs in WCCASA’s new office on 1164 Columbia Avenue in downtown Franklin, serving as a daily inspiration to the organization’s staff members. Because of the friendship of board member Cathleen Coyne and their connection to the story, local art group Vermillion Atelier carved the heart-warming image onto a piece of wood that takes up half of the first-floor hallway. WCCASA Executive Director Marianne Schroer, a licensed psychological examiner, says that those three girls “represent why we do what we do.” “The story of ‘B.’ is so important, but what it represents is even more so,” she says. “Our ultimate goal is for each child to be placed in a safe and permanent environment; no longer having a need for a CASA. That’s what happened here. In 2013, WCCASA celebrated 20 years of breaking cycles in the Williamson County community. And it’s been a year to remember, by all accounts. Just in the past three months the organization has claimed a two-story office building in downtown Franklin, added several prominent members to the board of directors, and announced the hire of Schroer. But what’s even more impressive are the stats that the organization can tout. In the last fiscal year alone WCCASA advocated for more than 300 children—that’s a far larger number than any previous year—and has had the capacity to serve each and every case presented to them, thanks to the 70-plus volunteer force. WCCASA Advocate Supervisor Audrey Freshwater says that the organization is so successful largely due to the dedication of the volunteers. And many times, Freshwater says, WCCASA advocates have a ripple effect in the lives of the children they help. “After the kids are placed in a permanent home, they often want their CASA to know that they are doing well in school, or that they made the basketball team. I have advocates that go to Beta Club inductions and award ceremonies,” she says. “But we also have adoptive parents who want the child’s CASA to know that they are doing well. “They want us to know that they have created a new cycle, and that the child is safe now.